(Michael Fein/Bloomberg News) In fiscal year 2009, the total value of Harvard's endowment fell nearly 30 percent to $25.7 billion. Harvard University suffered the largest decline in endowment funds of any major US college last year, as the financial crisis crippled the sophisticated but risky investment models that in prior years have made it the biggest and often best-performing endowment. The total value of Harvard’s endowment fell nearly 30 percent in the fiscal year ended June 30, 2009, to $25.7 billion, according to a national survey of college and university funds released today. Much of that decline is from investment losses - 27 percent; the fund’s balance also went down because the university needed to spend money on school programs. The Yale University endowment, the nation’s second-largest, dropped 28.6 percent, to $16.3 billion, while Stanford University’s fell 26.7 percent to $12.6 billion. The average drop for endowments across the country was 23 percent, based on a survey of 842 colleges and universities by the National Association of College and University Business Officers and Commonfund, an investment firm for endowments. It was a year in which the conventional wisdom of the investing world was turned on its head: Large, sophisticated endowments fared worse, overall, than smaller funds. The big endowments invested more of their money in hedge funds and other alternative investments, and keep less in cash. Smaller funds, meanwhile, had more of their money in plain-vanilla bonds, which performed better than stocks and more exotic investments, helping those endowments to stave off the worst of the losses. Harvard spokesman John Longbrake said the school is a “long-term investor with a strong track record.’’ Over 10 years, Harvard’s investment performance is an annual 8.9 percent gain, including last year’s losses. By taking more risks, larger funds over time have outperformed smaller ones. Funds over $1 billion gained an annual average 6.1 percent over the past decade, where funds of $100 million to $500 million averaged just 3.7 percent a year. A spokesman for Yale University said the school has earned 11.8 percent annually over the past decade. Many endowments have likely improved since June 2009, as stocks have staged a comeback, and the recession slowly recedes. Whether more endowment managers changed their approach in light of last year’s losses remains to be seen. Eric Upin, a managing partner at Makena Capital Management of Menlo Park, Calif., which manages money for endowments, said that if the economy and the markets continue to improve, the large endowments will again be rewarded for taking investment risks. Among other local schools, Boston College’s endowment fell 17.8 percent to $1.3 billion, and Boston University’s fell 22.1 percent to $892 million. The University of Massachusetts Foundation endowment was down just 4.6 percent, to $373 million, thanks to contributions from donors that offset an investment loss of 15 percent. Wellesley College’s endowment fell 21.4 percent, to $1.3 billion, in its first year without former endowment chief Jane Mendillo, who took over at Harvard in July 2008. The survey does not identify each school’s individual investment performance, just the overall decline in its endowment balance. It did report average investment performances and individual returns, without naming which schools had those outcomes. The average investment return, according to the survey, was a 18.7 percent loss. The best performance was an 8.2 percent loss. In the previous year, fiscal 2008, the average investment return was a decline of 3 percent average, which followed five straight years of gains, including double-digit increases in 2006 and 2007. Funds with more than $1 billion lost an average 20.5 percent in the year, while funds under $100 million fell 18.6 percent. For comparison: The Standard & Poor’s 500 Index of stocks fell 26.2 percent in the period. The survey reveals the significantly different investment appetites of large and small funds. Those larger than $1 billion in assets had just 24 percent of their money in US stocks and bonds, while funds under $500 million had much more - 43 percent. The large funds put more money in alternative investments like private equity and hedge funds. Those small funds also had as much as 27 percent of their assets in bonds and 9 percent in cash and short-term securities. The giant funds had only 3 percent in cash. Harvard invested all of its cash in the markets. That strategy added to the crisis the university faced last year when the markets crashed. Without cash on hand, Harvard scrambled to sell some investments it might otherwise have kept. The only schools in the top 25 endowments to fall less than the average were the University of Pennsylvania, with a 16.8 percent drop, and New York University, down 15.4 percent. At NYU, the $2.1 billion endowment benefited from a conservative stance, according to Martin Dorph, the university’s senior vice president for finance and budget: more in bonds and less in private equity and hedge funds. 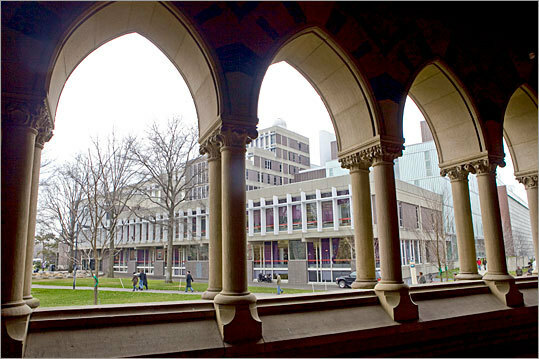 The 10 largest university endowments in New England. Search our database of university endowment data.